RED CHINA Plans Spring Invasion of India! Before launching into a critical study of the post-apostolic record, we need to examine first the Biblical account of the movements of the Apostle Peter. We need to ask: What would we conclude about Peter at Rome if we had only the New Testament? That is to say, it tells us only where Peter was not (with one notable exception) — and where he was not, from the New Testament account alone, was most certainly Rome. In the famous encounter of Paul and Peter at Antioch found in Galatians 2, we find the last notice of where Peter was, before his residence at "Babylon" mentioned in I Peter 5:13. The time would have been in the early 50s A.D., around the time of the Jerusalem Conference of Acts 15. [W. L. Conybeare and J. S. Howson, The Life and Epistles of St. Paul (Grand Rapids: Wm. R. Eerdmans Publishing Company, 1959), pp. 177, 833.] We also find there an important guiding principle as to the Apostolic endeavors of those two dynamic leaders of the early Church. Paul delineates the respective responsibilities of the two Apostles by writing "the gospel of the uncircumcision was committed unto me, as the gospel of the circumcision was unto Peter" (Gal. 2:7). The student of the life of Peter cannot help but be struck by the remarkable lack of understanding of this God-given commission on the part of many writers. It is so often entirely overlooked and ignored as if it had no relevance in determining Peter's ministry or travels. The Book of Acts confirms that Paul did fulfill his commission to the Gentiles from Syrian Antioch to Rome itself. The obvious reason that we do not read anything about the Apostle Peter's ministry after Acts 13, is that he, too, was fulfilling his ministry — to the circumcised Israelites — outside the regions prescribed by Luke's account — usually outside the boundaries of the Roman Empire. Thus from the scriptural commission of Peter as revealed in Galatians 2, we should not expect to find him laboring for, as some early historians had it, "25 years" of his later ministry within the clear domain of the Apostle to the circumcision. Chronologically, the next weight of evidence is nothing less than the entire Book of Romans written in the mid-fifties A.D. [Theodor Zahn, Introduction to the New Testament (Grand Rapids: Kregel Publications, 1953), Vol. 1, p. 434.] Taken in part, or as a whole, it becomes incontrovertible evidence that Peter was not at Rome at the time of its writing — and that he had not been there by the time Paul wrote. Most significantly, while over two dozen persons are either saluted or mentioned in passing, Peter is nowhere named in the entire sixteen chapters of Romans, which cannot be explained either by oversight or insult. He simply was not there. Moreover, the Church had not yet been "established," for Paul expresses the desire in Romans 1:17 to do so by imparting to them "some spiritual gift." It is inconceivable that Peter could have been at Rome and the Church not have been "established" in any sense of that word. But the absolute proof that Rome did not lie within Peter's jurisdiction, and was not "Peter's See," lies in Romans 15:20: "Yea, so have I strived to preach the gospel, not where Christ was named, lest I should build upon another man's foundation." Clearly Peter had not founded the Roman Church — a fact we will see totally forgotten and ignored by later ecclesiastical historians — or Paul would have been attempting to "build on his foundation." Furthermore, we must consider II Corinthians 10:13-15. If Paul refused to "boast of things without our measure" or "to stretch ourselves beyond our measure" (that is, jurisdiction or "line" of authority, see KJV margin), or "of other men's labours," we can be very certain that Rome was clearly within Paul's, not Peter's, area of responsibility and authority, and that Peter had not labored there — at least not up to the time Romans was written. And since the time of its writing was in the mid-fifties A.D., this would at the very least rule out any long stay of twenty or twenty-five years as was later claimed by some notable historians including Eusebius. And if Paul would have so dutifully held to his line or authority, circumspectly avoiding intrusion into another man's labors, could we not be equally certain that Peter would have held to the same rule? Therefore, if God had, as we have already seen, given Paul the first opportunity to establish the fledgling Roman congregation, and had put the capital of the Gentile world squarely within the commission of the Apostle to the Gentiles, why should we later expect to find Peter laboring there? 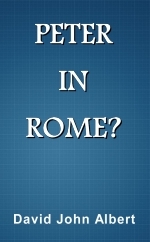 Was it not Paul who said, "I must also see Rome" (Acts 19:21)? Was it not Paul who was told "Thou must bear witness also at Rome" (Acts 23:11)? Where is there the slightest clue in the Scriptures that he would share this responsibility with Peter, the Apostle to the circumcision? Indeed, Paul did go to Rome after appealing to Caesar as recorded in Acts 28 and was there received, not by his fellow Apostle, but by "the captain of the guard" (vs. 16). What follows is his first Roman imprisonment in the early 60s A.D., certainly before Nero's persecution beginning in 64. During this time Paul, the "ambassador in bonds," is inspired to write the Prison Epistles — Ephesians, Philippians, Colossians, and Philemon, a total of four books, 15 chapters, 379 verses, but not one mention of the Apostle Peter, whom Catholic tradition would have at the height of his labors at Rome at that time. How much stock can we put in the later writers who ignore facts such as these in concluding Rome was "the See of Peter"? Then for a brief time, Paul is released, only to be arrested "as an evil doer" (II Tim. 4:9), and returned to Rome for his second and final imprisonment in the middle or late 60s. (It is not my purpose to establish an exact chronology.) From II Timothy we receive the last words of Paul on his condition, and our last opportunity to find the Apostle Peter at his side, but instead we read, "Only Luke is with me" (II Tim. 4:11). Note carefully that this is not just an "argument from silence," which some would wrongly claim is inconclusive in the case of Acts, Romans, and the Prison Epistles. This is a clear statement of denial that Peter was with Paul, and certainly the same city would be considered "with" him. And what of the others? "No man stood with me, but all men forsook me." Are we to believe that this includes Peter? Hardly. Even those who would seek to show that Peter was at Rome on other occasions, are forced to admit that he must have been absent during Paul's final days in that city. And to those who would thus accommodate their theories to fit the facts, we ask why would Peter have left his fellow Apostle in his hour of need. And what more important duty called him away at that critical hour? Whatever it was must not have taken very long, for as we shall see, the tradition that evolves in later years has them dying together under Nero at Rome on the same day! How much can credulity be stretched? Perhaps we can see the importance of studying the inspired Biblical record before we critically examine the uninspired testimony that followed. "Improbable," indeed! That Peter would have: (1) neglected his own commission to the circumcision to devote long years to the Roman Gentiles; (2) far overstepped his own line of authority and in so doing usurped that of the Apostle Paul; (3) gone unmentioned in the entire last half of Acts and in all of the Prison Epistles including II Timothy; and (4) forsaken his "beloved brother Paul" (II Pet. 3:15) in his hour of trial at Rome, this writer finds more than "improbable," but spiritually and morally impossible for an Apostle of God, and totally contrary to the internal evidence of the New Testament!